Check off another year of amazing growth for digital media now that 2017 is near its end. On-demand video and audio continued significant growth and the music business saw record-breaking revenues primarily at the hand of streaming's increasing acceptance by all age groups. In the nuggets of data released in Bridge Ratings' report "Podcast Report 2018 " our analysts' projections of a huge breakout year for podcasting were confirmed with revenues and audience growth spiking. New tech was introduced to the public this year (example: Castbox) that will allow more consumers to easily search and sten to podcasts. Bridge Ratings utilizes this type of technology with our on-going focus groups to gauge a) podcast consumption patterns among current podcast listeners and b) if this new tech would reduce the friction that has heretofore limited podcasting as a reach medium. Bridge Ratings conducted in person, telephone and on-line questionnaires to determine the most current attitudes about podcast listening now through the visor of the new technology which was described in detail to panelists. What we have learned is that 2017 has shown even more growth over our original estimates published in January 2017 with a significant increase in the number of people who said that they are listening to one or more podcasts weekly. The average time spent with each listening "session" has increased by 5 minutes and the number of podcasts consumed each week has grown from 7 to 8. This number has been impacted by a new category of podcast listeners - podFASTERS - who are using podcast players with the ability to increase playback speed. This flexibility allows this new class of podcast listeners to consumer a significant number of audio each month. Without the podFASTERS in our panel, the average number of podcasts consumed each week would have decreased from 7 to 6. Earlier this year the number of respondents with NO interest in podcasting had dropped to 41%. However, in this new released, the number has inched up to 42%. 31% listened to a podcast in the past 30 days, up from 28%. Those who have ever listened to a podcast increased to 44% this year. And, as podcasting begins to become more pervasive. the number of respondents who "may listen to a podcast in the next 30 days actually decreased this time to 14%. A. While technology has moved forward, 42% of the sample that have no interest in podcasting or haven't yet listened are still unsure as to how to find podcasts, where to look for them and how to listen to them. B. 30% just don't have the patience or the time to seek out audio programming they believe is available elsewhere. C. Of the 44% who have ever listened to a podcast, a quarter (25.4%) found the podcasts they did listen to be either boring, too long and rambling or the hosts were not very good communicators. Clearly, there are very high quality podcasts of varying lengths and topics that are compelling and hosted by professional-sounding people who have figured out that getting people to stay with their podcast requires thought, planning and an ability to present a focused discussion on the topic at hand. There is an art to verbal storytelling. Based on increasing interest by the public, reduced friction to search and access podcasts and interviews with 25 national and regional advertising agencies Bridge Ratings projects 27% ad spend growth in the podcasting universe for 2017 and 29% in 2018 with total 2017 spend nearing $255 million. As the chart below shows, this $255 million figure is an increase over our January estimates for 2017. 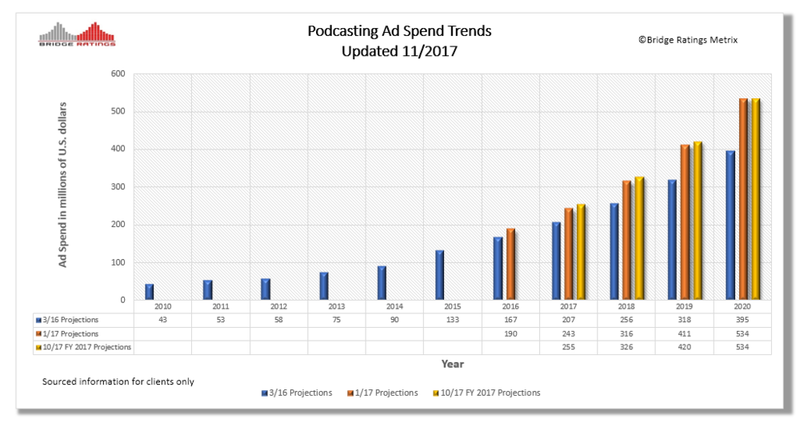 The chart below reflects podcasting ad spend growth from 2010 to 2020. The blue bars represent our original forecasts. Projections for 2017 and beyond were originally determined in January of 2017 and again in October 20017 based on similar sources of growth and ad agency interest.